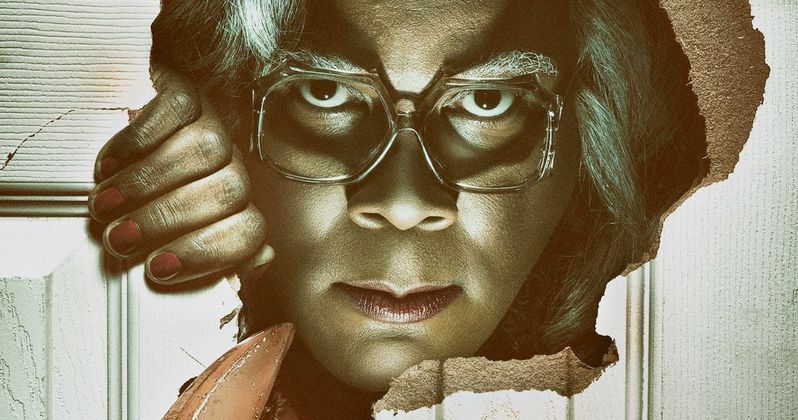 Just under two months after Lionsgate handed out a release date for Tyler Perry's Boo 2!, the studio has unveiled the first trailer, poster and two photos featuring Tyler Perry as Madea, along with some new and returning stars. The image features Mike Tornabene returning as Dino, Yousef Erakat coming back as Jonathan and Lexy Panterra as Leah, along with Inanna Sarkis as Gabriella. The poster also features a nod to the horror classic The Shining, featuring Madea playing "peek-a-boo" with a sharp axe. The original idea for Boo! A Madea Halloween came during the making of comedian Chris Rock's directorial effort Top Five, where the actor/director approached Tyler Perry about making a fake Halloween movie for Top Five. Lionsgate then approached Tyler Perry, suggesting that he actually make the movie for real. Last year's Boo! A Madea Halloween debuted atop the box office last October with $28.5 million, in a very crowded weekend that also included Jack Reacher: Never Go Back, Ouija: Origins of Evil and Keeping Up With the Joneses. It ended up making $74.8 million worldwide ($73.2 million coming from the U.S.) from a $20 million budget. The original movie also featured rising stars such as Bella Thorne and rap artist Tyga, but neither of those stars will be returning. However, other actors from the first movie such as Brock Hurn (Horse) and Jc Caylen (Mikey) will also return, with UFC legend Tito Ortiz. This sequel will hit theaters on October 20, and just like its predecessor, it will also be caught in the midst of an extremely busy weekend in theaters, with a whopping six movies slated to open in wide release. Also arriving on that date is Paramount's Geostorm, Sony's Granite Mountain Hotshots, Universal's The Snowman, PureFlix's Same Kind of Different As Me and The Weinstein Company's War With Grandpa. Still, the first Tyler Perry horror-comedy managed to take down a number of high-profile competitors last year, so it will be interesting to see if it can pull off the same feat two years in a row. The first Boo! movie poked fun at a few horror classics before it hit theaters, with one poster claiming Madea is The Exorsister, a reference to the 1973 horror classic The Exorcist. The movie also used the classic Halloween movie poster, and the tradition continues with this sequel that offers a not-so-subtle nod to The Shining. Tyler Perry will also release two more movies next year, Tyler Perry's a Madea Family Funeral and Tyler Perry's She's Living My Life, which are both in post-production. Take a look at this trailer, poster and two photos for Boo 2! a Madea Halloween.